Spoof news: Prince Philip Says: "I'm Not Going To The Bloody Sodding Royal Pageant On The Buggering Thames In No Barge And That's That!" Prince Philip Says: "I'm Not Going To The Bloody Sodding Royal Pageant On The Buggering Thames In No Barge And That's That!" Leave Im Alone Ya Barsteds! He's Faaaamily Innit! Following Prince Philip's Friday night "Stuff the ruddy buggering Diamond Jubilee!" tirade, Buckingham Palace staff were forced to flee the building again on Saturday evening, when the Prince flatly refused to go on a glorified barge in the Great Jubilee Pageant. And then threw a wobbler. "I was terrified," a chambermaid told reporters. "He was eating a Cornetto at the time, and then the Queen started having a go at him, telling him to have a bath and a shave, and he went ballistic. He lobbed the Cornetto at the telly, smashed a couple of Ming Dynasty vases, stamped on a corgi's tail and stormed out of the room swearing like a trooper. Her Majesty was absolutely gobsmacked." 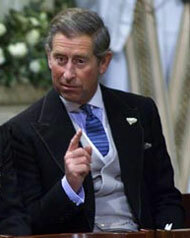 Further investigations, involving an inside network of Palace moles, revealed that Prince Philip got the right hump when the Royal Yacht, Britannia was decommissioned, and that he'd demanded a replacement, like the ones Chelsea FC owner Roman Abramovich has, but that Her Majesty was advised against the move on austerity grounds by a team of cap doffers, much to the chagrin of the Prince. "He's not keen on the idea of a barge," one of the moles said. "In fact, he was horrified. He's Greek you know, and the Greeks have a proud maritime history. It must be extremely humiliating for him to travel on a barge - a vessel associated with the coal industry and gypsies, no matter how much they tart it up - the feeling of lowering oneself below one's station must be shattering. So he's basically told everybody to 'get stuffed.'" "I'm not at all sure how one is expected to resolve this," Royal Watcher, Penny Farthing told reporters. "It seems like the old duffer's really lost the plot this time..."